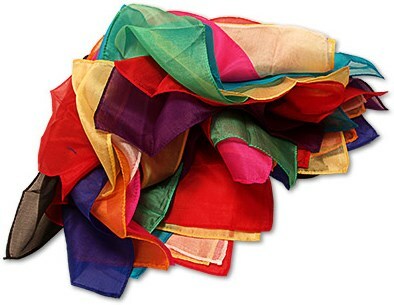 The G&L Professional Fountain of Silks are known and used by performers all over the world. This is because of the highest quality of all materials that are used in constructing them. They are built here in the United States by G&L. The small bundle can be hidden behind a prop or pulled from a production item such as a Square Circle. The first silk opens and the remaining silks (18 inch) flower open in a burst of bright colors. The effect ends with a large bouquet of Mylar Spring Flowers. This effect can be seen on the largest of stages or can be performed in a small living room. It uses a rubber loop and velcro which makes it very easy to grasp prior to performing the effect. Full instructions with photos, also include tips on how to maintain and store the effect when not in use, as well as tips on keeping the effect for many years.